This year, the Upper Room publishers put together a little paperback discussion guide concerning the Disciplines 2008. I bought it because I thought it might give me some questions that I could use in a blog post. What impact does it have for you to realize that Jesus' earnest prayer is an earnest prayer for you? I remember the first time I really concentrated on this passage and thought about it. It was an evening book study class, and my co-teacher was leading. He pointed out that this is a prayer for us, and for those who will follow Christ because of us. I had never paid enough attention to these verses to notice that, and I was amazed at the thought that Jesus had prayed for me. I know what it is liked to be prayed for my friends. It's a grace-filled, wonderful revelation to know that someone has lifted you and your concerns to God. How much more is it a moment of grace to know that Jesus has prayed for us? I found this benediction on the RevGalBlogPals site. It was used frequently by Rev. Dr. Doug Oldenburg as he traveled the country as moderator of the Presbyterian Church (U.S.A.). "As you leave, I charge you to remember this above all else. You need not be afraid, for GOD GOES WITH YOU. And God goes above you to give you vision and hope. Remember that: no matter how dark and frightening this world may become; no matter how frightening the individual circumstances of your life may be today or may become tomorrow or next week, you need not be afraid, for God – Almighty God – goes with you! If you will remember that, then the 'peace of God that passes all understanding' will go with you too." Activity for this week: Go to your sanctuary and stop at each pew, praying for the person who usually sits in that space. In the opening worship service of General Conference, the sermon was centered on the idea of hope. The bishop who delivered the sermon said that hope in today's world is becoming marshmallowy. It is becoming soft, appealing, but melts into the ground when it comes close to the first. Hope from God is different from that. It is the secure confidence ina future reality. Hope is waiting with eager longing and unfettered imagination for the future. Uganda has the highest orphan rate in the world. The orphans live in refugee camps, in horrible conditions. In an effort to bring hope -- not the marshmallow kind, but the kind that will stand the test of the fire -- some of the children were "rescued" and taken to a school that the United Methodist Church has established in the Area. The Hope for Children in Africa choir was formed. On a visit the area, the bishop from the South Georgia conference thought that this children's choir should travel to General Conference, and that his conference would fund it. The choir sang "I've got a Friend in God" and danced during a Celebration moment in General Conference. The response was so overwhelming that the choir sang a second song. Six months ago, these children were starving. Now they are fed, clothed, medicated and educated, and they have traveling to Texas to share the news that they are Friends of God. Hope. Resurrection hope transforms lives and changes futures. Amen. Image: Rainbow the other afternoon on the way home. Do you recognize the tree to the right? It's redbud. In our part of the country, redbud is one of the first trees to bloom in the spring. 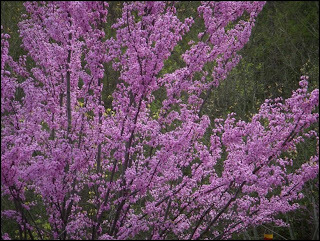 As I drive down the interstate, and see the redbud blooming (it's actually a pink/purple color), I know that spring is on its way. It stands in sharp contrast to the leafless trees of winter. Redbud is a harbinger of change. Someone at church said to me today, "There is a lot of change happening." It's true, and it's especially true for our church. It is also true for me. Change is coming. Because of the LORD's great love we are not consumed, for his compassions never fail. They are new every morning; great is your faithfulness. I say to myself, "The LORD is my portion; therefore I will wait for him." I read a book once by Sheila Walsh called "Extraordinary Faith." When I bought it, I thought that it would be able having an extraordinary faith in God. But it wasn't. Her premise was that God has extraordinary faith in US. How's that for a revelation? God has faith in you. If you will open your church to the youth this weekend, I will bring 19 young creations into your care. I have faith in you, that you will love them. If you do, all will be blessed. If you will light 100 candles on a table, and tell these youth that 100 of my children die in five minutes, I will descend upon the room, all will be quiet, and perhaps they will be changed. If you will light candles and sing, I will make my presence known through your love to 27 searching Christians. If you will be patient and listen, when I say, "Wait. Just wait for now," then you will see me moving. God is a God of extraordinary faith. It is amazing to me that he has faith in us, that he calls us to do his will, even when we do not have faith in ourselves. Is that perhaps what trust is about? Can we trust God enough, even when we do not have faith in ourselves, to follow, because we believe that his judgement is better than ours, and we know that he has faith in us? I was listening to the report of the General Council on Finance and Administration yesterday. I was struck by what the President of the council, Bishop Mary Ann Swenson, said, and it started me thinking. Our consumer-driven culture has given us an attitude of scarcity. That attitude inhibits our ability and willingness to serve God. Consider Jesus as he prepared to feed 5000 people. He took five loaves of bread and two fish, and thanked God for them. He had faith that this relatively small amount of food would be abundant. And it was – after every one fed, the disciples gathered 12 baskets of food. God will not call us to a task unless he provides us with everything we need to accomplish it. The word abundant has a word origin which means “overflowing.” Our gifts from God overflow. Our cup “runneth over” – it overflows. I think stewardship begins with a relationship with God – trust in God. It begins with a realization that all of our gifts come from God – they are grace, freely given, never earned. Once we understand that, then stewardship is response. It is a response to God’s grace in our lives. Stewardship is the management of the gifts that God has placed in our hands, but it is management using His priorities, not our own. Those gifts may be abilities, skills, money, time – once we realize that all of those are from God, then our response flows – in fact, overflows, out of gratitude. I believe we come to find that as grace transforms us, our priorities become aligned with God’s, and the stewardship that we do becomes a blessing and grace in our lives – another gift of God. I was listening to the Live stream from General Conference again today. A young girl was being interviewed on stage. She had made it her goal to raise money for Nothing but Nets (link in the sidebar). So far, she has raised $40,000 for the program. Read that again. This little girl, about 8 years old, has raised $40,000. Her goal for the future is to continue raising money until every child in Africa who needs a net, has one. We fell sometimes, don't we, that we can't make a difference in the world. Obviously, if a young girl can change the lives of 4000 people, mainly children, then we can too! It was truly a blended service, in all ways that I could think of -- the music, the people, the bishops, the language -- it felt diverse and blended. During the prelude, one of the choirs was singing, and it was being directed by a man in a black robe, over which he wore an Emmaus cross. Cool! The altar was constructed from wood taken from a church destroyed in Katrina. The worship leader led a prayer to consecrate the facility. She said that the ordinary has been brought together, and made extraordinary by God. "Ordinary water becomes extraordinary when it comes into the presence of God. Several people read scripture. It brought to mind to me the idea that when scripture is read by those who are interested in bringing it alive, God's word becomes real. Right before the reading of the gospel, a cross and a bible were carried to a table in the middle of the room. The minister reading the passage stood at the table and read. It was God's word read among the people -- beautiful symbolism. This same table became the communion table near the end of the service. As a woman sang, "I still have Joy," the bread and wine were brought to the table by deacons. They then stood around this round table, swaying and clapping to the music. What a great communion image! Joy! The congregation joined in the ritual through the singing of the words. It brought to mind for me the unity of communion, for what better illustrates unity that singing? Near the end, the elder lifted the bread, broke it, lifted the cup in blessing, but didn't speak a single word. As he neared the end of this, a soloist began signing "Let All Mortal Flesh Keep Silence." How about a few quotes? Can we believe that God is bigger than we can conceive?" We who are many people are one people -- the people of the United Methodist church. Resurrection hope transforms lives and changes the future. Hope for me is a pink mosquito net. Waiting with eager longing and unfettered imagination for the future. Who would ever be able to predict that sitting on my couch in my own house that I could watch the opening worship service of General Conference in Texas. The world continues to grow smaller, and I continue to be more and more pleased that I am one of the people of the United Methodist Church. One of the ministries in our church is a prayer shawl ministry. As you can see in the picture above, there are many Sundays when there are over 10 shawls on the altar rail for dedication. This Sunday there were two. One of them was a baby blanket. After worship, the knitter of this blanket presented it to a new grandfather in our congregation. His granddaughter was premature -- 1 pound 11 ounces. She is doing well, and is now over 4 pounds. Her grandfather was deeply touched by the action of this knitter, and the gift of a prayer shawl for his granddaughter. Think about this prayer shawl ministry. God lead the knitter to spend time on creating a blanket for a child she has never met. She did it because of God -- because by doing so, the grandfather, the baby's parents, and perhaps the baby herself would be flooded in grace. Be accountable for the hope that it is you. Do people see hope when they look at you? At me? I have a friend who often prays for clear vision (even though I say he already has it). Clear vision is something that we all say that we would like to have, I think. What does God want me to do? When does it he want me to do it? What is God's will for our lives? What is he telling me right now? I think that we want to see our God. But filled with the Holy Spirit, he gazed into heaven and saw the glory of God and Jesus standing at the right hand of God. "Look," he said, "I see the heavens opened and the Son of Man standing at the right hand of God!" But they covered their ears, and with a loud shout all rushed together against him. What struck me about this passage was not that Stephen had clear vision -- he certainly did, and he definitely saw his God -- but notice what happened. "But they covered their ears." Do we do that? Do we cover our ears so as to not hear the Word of God? I think we do. I think we close our ears to God's word when it calls us to step out in courage, or when God is asking us to give up that which we do not want to give up. For those stoning Stephen, they had a particular religious viewpoint, and they were not going to let God interfere with their beliefs. So they covered their ears. Heavenly Father, open the eyes of our hearts. Give us clear vision. Also, Lord, please move us to drop our hands, so that we can hear you, too. Amen. Take a look at these two images. 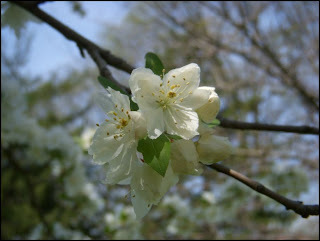 They are of the same type of flowers, perhaps even on the same tree. They were taken the same day, in the same light, by the same photographer (me) using the same camera. What is the difference between them? It is the background. The out of focus, unimportant background makes all of the difference in the two images. 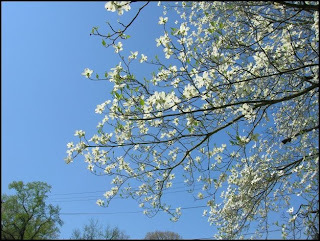 In one, the white flowers and the light sky behind the "focus" of the image has no contrast with the white flowers. 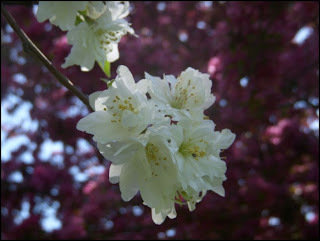 In the second one, the pink flowers behind the white ones, even out of focus, make the the subject of the image just POP. We can see the white flowers -- their outlines, edges, shapes, etc, because of the pink ones. In photography and in Bible study, context matters. It occurred to me, as I looked through these images, once again how true that fact is. In Bible study, the context of the verse -- it's surrounding information, the person who wrote the passage, the audience to whom it was written, the needs of the people hearing the message, the culture of the time -- all of those facts, even though out of focus, and not the subject of the study, are important. Without them, we will miss what is right in front of our eyes. We will not see that upon which we are focused because the background is important. Images: Both were taken in our park yesterday. In the past couple of weeks, two people have told me that they live lives blessed by God. In a world which sinks under the stress of complaints, whining and unhappiness, that is a wonderful thing to hear. What makes them so different than those who would not say that? For one, they are right -- they are blessed, but so are so many other of us. I think a big difference is that they are AWARE of the their blessings. What a difference that makes in our lives. I think that when I first read this book, I didn't fully appreciate the narrator's personal musings on everyday, seemingly mundane experiences. For example, he mentions watching a couple walking under a tree after a rain, and the man grabbing a branch and dousing them both with the water from the leaves. The narrator ties this into baptism, and how water is for blessing before it is for gardening or washing clothes. One phrase in that quote struck me; I've emphasized it above. Is that the normal way we view life? Do we see the blessing in something before we see its mundane-ness (I know it's not a word, but work with me.)? How would our lives be different if we gave thanks before we complained? If we saw the blessing FIRST? How would our outlook change if we remembered the presence of God before we started worrying? Maybe then we would say, "I live such a blessed life." Image: Ordinary maple tree (I think) in the park. What? Do you think I am a botanist? and carried it up the hill. and carried it to its death. We are called to carry our cross. and to walk on his path. What is the weight of our cross? it does not carry our sin. It is not stained with our own blood. that our unrighteousness would have made it. He took all of that away. He said, "Father, forgive them." Forgive me, Father, for I am one of them. And the Father says, "I am." He says, "I am, and I chose to become one of you." What is the weight of my cross? What is the weight of not carrying it? That path leads to death. To the absence of God. burdens me with my own choices. With the weight of my sin and death. So I will carry my cross. I will lift it high. I will raise my voice in praise. I will raise my thoughts in prayer. And I will celebrate the weight of my cross. Note: Poem inspired by the Third Day song, "Carry my Cross." 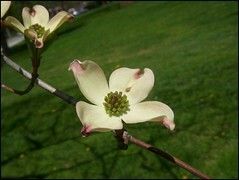 Image: Dogwood blooming (almost) in the park yesterday. On the blog revgalblogpals, there is a weekly Thursday "column" where ministers ask questions about their churches or their ministry, and other members of the community try to help them to find answers. The question this week had to do with what to do if a family in the church is having trouble making ends meet -- in fact, this family is about to become homeless. What does a church do? As they answered the question, a reference was made to Acts 2:42-47. We've been talking about this in our church for about a year as part of our visioning process. How do we put this in action in our modern churches? What does it mean for a church to answer God's call in this situation? One of the people writing the blog post said that when someone in her church was faced with a similar situation, another member volunteered to pay the hurting family's mortgage payments for a year. Amazing. Our church organized a fund last year in honor of one of our members. It is called the Jim Ray Fund for Others. When either members of the church or the community come to the pastors, asking for financial help, then money is already their to provide it. It seems to me that these are examples of "giving to anyone as he has need." Modernized. How are we called to be a church? Perhaps one way is that we are called to make the needs of our brothers and sisters in Christ more important to us than we would otherwise. Perhaps we are called to respond to God's love for us by sharing God's love with Others. I was driving to work today, thinking about class tonight. The session was about the 5th chapter of Weatherhead's book The Will of God. The chapter is called "In God's Will is Our Peace." I was thinking about peace and living in the will of God when the song "In the Light" by DC Talk came on the radio. Is that what we are hoping to do? To live "in the light?" 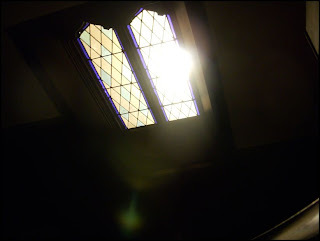 To be in the light -- to live in God's will at the intersection of our wants and God's needs will bring us joy and peace. Image: The church on the way to dinner tonight. It's late; I'm tired. I thought a little day dreaming might be fun before I go to bed and do some real dreaming. Question: If you were free to travel and money were not an object, where would you like to go? I'm sure that there are other places, but I'm going to bed! Acts 7:55-60 -- The Stoning of Stephen. The GBOD material points out that both of these passages speak to the idea of sowing seeds. No one, at the time of Jesus' talk with the disciples on the evening of the last supper, could have predicted the effect of the crucifixion (and later resurrection) on the disciples. They would be changed -- they would be reborn, and from that, the church begun. Jesus was sowing seeds. Consider the stoning of Stephen. Those who threw the stones laid their coats at the feet of Saul. I wonder what effect Stephen's speech and stoning had on Saul. Did Stephen sow seeds? I was privileged to be in the chapel on Saturday to pray for Steve before and after his Emmaus talk. During that time, I was thinking about how Steve and the other members of the team were sowing seeds in the hearts and minds of the pilgrims. Who knows what will grow from these seeds of transformation. I pray God nurtures the seeds and that the pilgrims will allow them to grow. Often, we do not know and will never know the fruit of the seeds that we plant. We aren't called to predict that kind of thing. We are just called to sometimes plant, sometimes water and sometimes reap. It is a blessing indeed to see the work of God which results from our obedience to him. 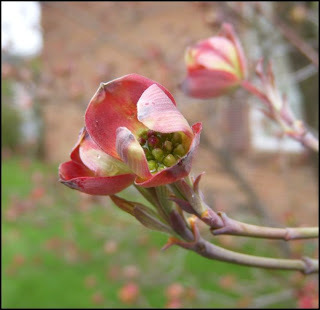 Images: Dogwood just blooming in Ashland at the church where the walk was held. Another Emmaus event tonight -- closing. Another communion. Once again, as I mentioned yesterday, I found myself walking down the aisle toward the Lord's table, once again with my hands on the shoulders of the person in front of me. This time the person in front of me was our friend -- JtM -- and the person behind me was my husband. As I wrote about yesterday, I wondered, as short as I am, if I were grace or burden. We reached the two men serving communion, and, like yesterday, I shared communion with two special people. Is there a message for me in the gift of sharing communion with friends two days in a row? Trust the friendships and quit worrying? Tonight was a candlelight service in our Emmaus community. Prior to that, the community shared communion. It is part of the tradition of our community to walk down the aisle toward the Lord's table with our hands on the shoulders of the person in front of us. I'm short. I always worry, and always think about the weight of my hands on the shoulders of the person in front of me. Am I pulling down too hard? Are my hands a burden on the person in front of me, rather than a comfort? I wonder the same thing about other parts of my life. Are there times when I pull people down rather than comfort them? Are there times when my presence is more of a burden than a grace? Are their instances when I am not support, but am instead a hindrance? Once we made it to the Lord's table, I turned around to place a hand of support on my friend, standing behind me when I noticed that another friend, standing behind her, was doing the same. The three of us are part of the same reunion group, and support each other often, but it was a gift of grace to me to stand with the two of them, the three of us receiving communion together. I thank God for that moment. 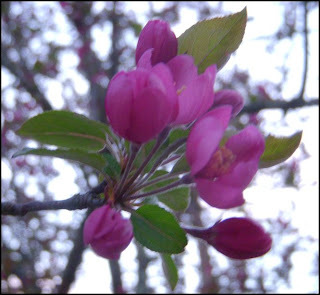 I stopped this morning in my driveway to take some time to enjoy our crab-apple tree. Most of the year it’s ugly – I must admit. In the summer it drops leaves, continually, and when it has fruit, those are always falling on the ground, too. It’s not like a beautiful maple in the fall – it’s just a bare tree with a few straggling leaves. In the winter – just dead wood. 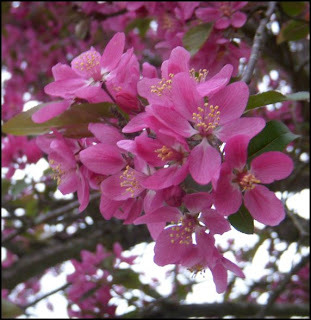 But in the spring, when the weather is right, it blooms a beautiful dark pink color. 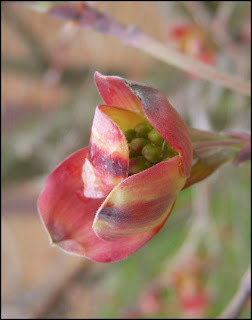 I’ve posted pictures of the buds opening for the past two days. This morning, most of those buds had become flowers. 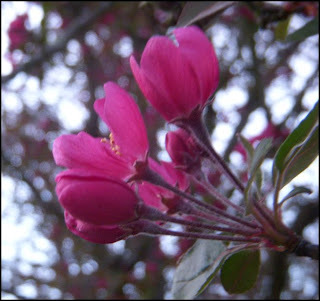 It was at its most beautiful for the entire year – covered in pink flowers. Me, being me, tried to take some pictures. The problem with taking close-ups of flowers is the wind. 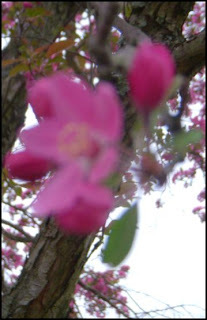 If the wind blows, the flowers moves, and the image is blurry. This morning was overcast, so there was less light than a sunny day, which means longer shutter “open” times, which means that the images were even blurrier. Standing there, under our beautiful pink tree, with the wind blowing, and the braches softly stirring under its motivation was a grace-filled time. 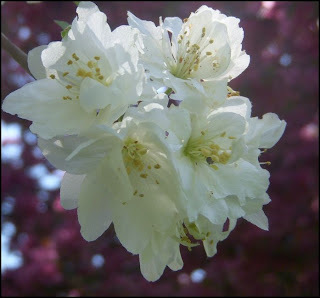 The wind reeked havoc on my pictures, but it the movement made the flowers, in person, even more lovely. It was just loveliness that was impossible for me to capture. That’s frustrating for me. I can see, right in front of me, the image that could be captured. I take the picture, and it’s awful. Blurry, focused wrong, just not at all what it could have been. So I just give up (after several attempts). Is God sometimes like that? Is he a three-dimensional God in a two-dimensional world? Is he a God of motion pictures, when the only tool we have is a “still” camera? There is so much about him that we can never capture, never explain, never understand. And yet, knowing all of that, and seeing him “in a mirror, dimly,” we still know that he is lovely beyond imagination. And then, for one brief moment, the flowers stop dancing in the wind, and I can get the picture. For one brief moment, we see God clearly, and then the Lord of the Dance moves again, and we are just left with memory of clarity. I know that the first day of spring is in March. I mark it on my calendar; I watch for the transition every year. I say to myself, "It's spring; why is it snowing?" Really, though, for me, spring comes a little later than March 21. Now is when I start noticing that spring has arrived. 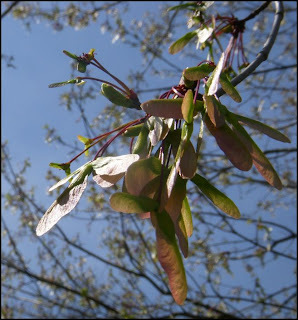 The weather is warmer, the daffodils are blooming, and our crabapple is starting to bud. 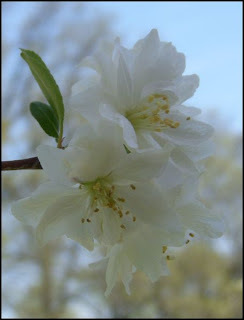 The trees in front of our church have large mounds of white flowers on them. When it rains, tiny petals from the trees litter the ground. Now is spring; before, we just had the promise of it. you open doors for life to enter. And so it will be, as you are recreating me. I remember thinking at the time that I had never noticed that the last verse was spring. 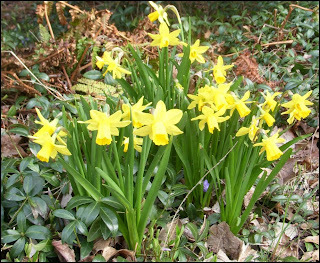 We so often think of spring as being the beginning, with winter as the end. I was glad that she had written it the way she did, ending with the beginning. Then, a few hours later, as I was working in the lab, Steve called to tell me that Jim Ray had died. Even at the time, that day, I connected those two events in my mind. I was glad, that day, that perhaps God had pointed out to me that the end is not the end; that the end is the beginning. I think we are called as Christians to know that reality. It's not what society teaches us to expect, but in so many ways, it is true. In times of change, the end is so often the beginning of something else. We have an endless God, who, because he loves us, even turned our death into a new season. There is not an end; there is only spring. in our doubt there is belieiving; in our life, eternity. 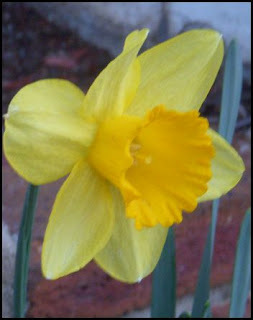 Images: Our crabapple tree; one of our few daffodils. I ran across a post today about prayer on the blog Palabras de Deb. She wrote about the power of praying together. Developing relationships with fellow pray-ers should create a safe space to cry, to laugh, to lament, to grieve, and to celebrate. It is a beautiful and holy thing to listen with focus and care. Listening and caring are essential in our relationships with one another. And while sometimes we regard them as one in the same, listening and prayer are distinctive, and being able to pray with someone, or have someone pray with you, offers something wholly different than simply listening. A prayer connection is different because it intentionally brings God into your relationship. It reminds you that God is the ultimate provider, that we are dependent on God, and that we must remain connected to the divine in all we do. F or two years now, I worked with a team of friends on a 40 Hour Prayer Vigil in our church. For two years now (and in the intervening time between vigils), I've been surprised how unwilling our congregation is to share prayer concerns. We ask the members to submit them, but they rarely, if ever do. In contrast, our Common Grounds congregation is very willing, each week, to submit prayer requests. I wonder why that is. I wonder why one group of people, some of whom have known each other for over 50 years, are not willing to share prayer concerns publicly, while another group, many of whom are strangers, meeting each other for the first time, will pour out their hearts in prayer concerns. I have friends who pray for me, and who invite me to pray for them. It is an indescribable gifts. And I agree with Deb's theory -- having a prayer connection intentionally brings God into your relationship. I think that's why I so much want our congregation to start praying for each other. When I teach about prayer, I teach that it is a way to develop a relationship with God. I don't think I ever thought about it as a way to invite God into our community, but of course it is. I just wish sometimes that we were more willing to issue the invitation. Images: Sunset this evening. 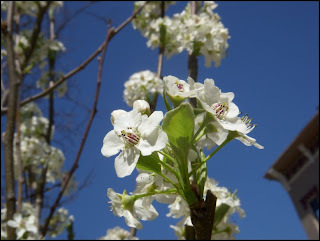 Our crabapple tree about to bloom. I was thinking today about gender and pronouns. How do you refer to God? Do you call God a him? I have a friend who sometimes calls God a her. He (the friend) usually does it in notes for the class which we team teach, in the part that I'm teaching, so I think he just does it to throw me. He's like that. For me, God is a him. 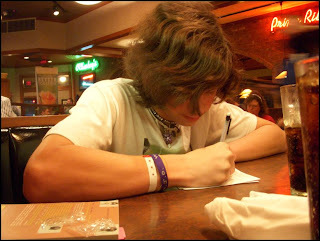 If you read this blog very often, you'll see that I refer to God with masculine pronouns. Even so, I don't think that God actually has a gender as we know it. I think I'm made as much in the image of God as a man is. I also think that God has both male and female stereotypical characteristics. I was thinking about this today. God is God, and he is impossible to describe in words. And yet, we try, because we are called to try. I think that even though God is impossible to grasp, he gives us analogies to help us understand him. Jesus refers to God as Abba -- father. Not only that, but it is better translated as Daddy. Jesus is giving us a way to draw closer to God. It's a God-given analogy. I think where we get into trouble is when our analogies are human-made. If we provide the frame of reference, then we are more likely to box God in, than to draw closer to him. For instance, when we provide the analogy to Father, then we are going to say that God is just like a father -- male, with male characteristics. We box him into our own image, rather than using the image he provides to us. We become legalistic, rather than graceful. So, as long as my "he" in reference to God is used to bring me closer to God, then I'm doing OK. It's when I insist that my frame of reference for him completely describes him that I'm creating an idol out of my own images of God. Do you remember me mentioning the hymnal survey a while back? The GBOD conducted an internet survey as it prepares for the compilation of a new hymnal. The results are in, and they can be found at this link. People REALLY like Amazing Grace. Is it because we all know it? Or is it truly that it touches such a deep chord in all of us? I'm glad to see Be Thou My Vision among the favorites. Is it interesting that some of the same songs are listed as among the top 20 favorites AND the 20 least favorite hymns? Does that say anything to us about our congregations? Don't we need to realize that God reaches all of us in different ways? Some of my very favorite hymns made it onto the two top lists - top 20 from the hymnal and top 20 from The Faith We Sing. I wonder from the top three - five least favorite hymns that there was perhaps some external pressure exerted from more conservative groups to remove hymns which give God a feminine face. Perhaps I'm wrong? Silence, Frenzied Unclean Spirit is one of my least favorite hymns. I wonder if we should be singing more hymns than we do rather than repeating them so much. Do you agree with the survey? One of the lectionary readings for today is the Walk to Emmaus passage -- Luke 24:13-35. William Barclay, in his Today's Study Bible commentary, titles this section in his book, "The Sunset Road that Turned to Dawn." 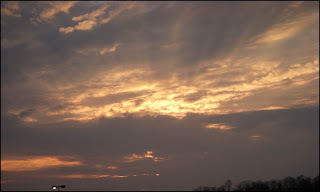 He says that when Cleopas and his companion were walking to Emmaus, they were traveling west in the evening, toward the sunset. As Christians we are always traveling toward the sunrise -- toward the new day. He wonders if perhaps this is one of the reasons that they did not recognize Jesus. Do we miss him because we are watching the sun go down, rather than standing on the hope of it rising? Are we facing the wrong direction? Are we walking away from him? Image: Tree downtown after lunch today. I'll leave you with this thought. Recognize the flower? 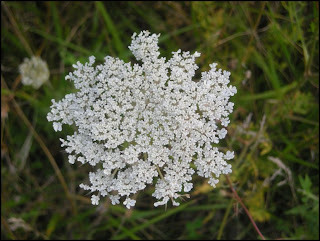 We called it Queen Anne's Lace when I was a kid. I've knit lace, and what makes lace so beautiful is not the lace itself, but the open spaces it creates. Is there anything else that is beautiful for the open spaces -- the parts that we do not create? You only accept the amount of love that you think you deserve. It struck me that sometimes this is true. I don't think that it is true all the time, but sometimes we do limit the amount of love we will accept because we don't feel that we have earned any more than this "limit." Have you ever gotten a gift -- for Christmas or whatever -- and felt bad that you didn't have a gift to return? Have you ever bought "extra" gifts, just in case? You don't plan to give them to anyone unless someone you don't execpt gives you a gift. Do you ever feel like when someone does something nice to you that you need to "return the favor?" What does God tell us? God loves us all more than we deserve. He showers grace on us abundantly and without limit. Do we hide our heads, refusing to believe that Gove only loves us as much as he does? Today, in Oconomowoc, Wisconsin, a backhoe hit a gas line, causing a natural gas leak. Later that day, the gas exploded, creating a fire at the almost 100 year old First Baptist church. The church and a nearby house, were destroyed by fire. I do believe that a church is not the building. The church is the people that God has gathered together to form a church family. The church will go on without its building. I am sad for this church, just as I would be sad for a family that lost their home. I imagine all the memories attached to the place. The weddings, the funerals, the baptisms, the confirmations, the youth meetings, the luncheons, the fundraisers for mission work, the worship, the prayer, the Sunday school classes and the fellowship.... Of course, the destruction of the building doesn't negate any of that, but that doesn't mean that the actual church -- the people -- won't be so horribly sad at their loss. The church is not a building, I know. 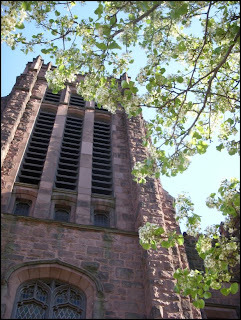 But the building is the physical home of the church, and I sympathize with their loss. There was a comment on yesterdays post that I want to consider today. A simplistic profession of faith in Christ is inadequate apart from a changed life. That having been said, Scripture is exceptionally clear on the matter of confessing faith in Christ. Never are silent saints praised. Regardless of what might be our own personal proclivities, our affirmation of Christ is to be clear and unequivocal. Such does not at all constitute a prideful parading of our faith. I want to thank Earl for the comment. "A simplistic profession of faith in Christ is inadequate apart from a changed life." I agree that God leads us to a changed life. It's ironic that this would come up again, because back when I was talking about WinterJam, this is exactly what I meant. I think a changed life might not occur with just a simple profession of faith, and that we need to continue to nurture new Christians even after a simple profession of faith. It is, however, a first step that we should celebrate. "Never are silent saints praised." I think we always set ourselves up for problems when we use the word "never." Never is a pretty legalistic word. And aren't there times when silent is exactly what God calls us to be? Aren't there times when actions are louder? I hope that my pairing of this topic with the statement about Methodists didn't mislead anyone. I agree that speaking of Christ is not a "prideful parading" of our faith. My point is just that perhaps speaking of our faith is a fruit of our transformation, not a condition for it. Twice now, I've heard speakers say that salvation depends on accepting and believing in Christ, and then confessing it "with your mouth." 9That if you confess with your mouth, "Jesus is Lord," and believe in your heart that God raised him from the dead, you will be saved. 10For it is with your heart that you believe and are justified, and it is with your mouth that you confess and are saved. I believe that any understanding of a passage has to be seen in the light of the message of the rest of the scripture. Does a simple understanding of this passage -- that we must discuss our new found belief with others for it to have the power to save us -- make sense in the light of grace? Doesn't the idea of speaking about God as a condition of salvation sound like there is something that we have to do to earn grace? One key comparison with Mrs. Clinton is [that while] she talks about being raised Methodist and being a Methodist all her life, she was taught not to put religion on her sleeve. That's such a Methodist way of putting it: to talk about faith would be prideful and boastful about your faith. For Bill Clinton, it's not parading your piety; that's just who you are. He had a language to communicate his faith that she has had to develop." It's kind of a sad statement about Methodism, that we would consider it prideful to discuss our faith. Could it be that speaking about our faith is not a condition for salvation but is instead the fruit of transformation? Could it be that once grace enters our life, once God begins to change us, that we will not be able to help but to share the Word? I know that after my Emmaus walk, one of the changes I noticed in myself was that I was much more willing to talk about faith that I had been before. Could it be that confessing our faith is not so much a condition of salvation but is instead evidence of it?